Where did I put that sales receipt? If you picked up a Nintendo 3DS XL recently then chances are you're currently treating it like a piece of treasured jewellery, delicately laying it on a soft cushion when it's not in use and generally ensuring no harm comes to it. However, dovetastic - presenter of the YouTube Microwave Show - had no such ideas. He took his shiny new console and microwaved the seven hells out of it. The results of which are currently on eBay, selling for $2,241.00. Needless to say: don't try this at home. Very strange! Who would wish to Microwave such a beautiful piece of technology? why would anyone waste money on that??? NO! NO! STOP TORTURING THAT NINTENDO PIECE OF HARDWARE! yeah, idiocy has no limits. @NinRyan Well said sir, well said! lol. if you look at the offers, everyone is just messing with him. i'm sure he's just putting this up on ebay as a joke though. It set FIRE!?! Why do you insist on torturing this poor soul? The things people do for attention these days. He calls it "art" I don't think its art I think it stupidity. Art for example would be the game boy that survived a war and is still working now that's art. So they're taking a $200 piece of technology, putting it in a microwave, and selling it for $2000+? What is wrong with people? Well, I'm off to go microwave my PSP so I can sell it for $3000. Oh wait, it is a red one. Nevermind. I wonder what kind of unnecessarily rich person will buy the "results". Microwaving a specific item has always been a tradition on YouTube, infact there's an entire channel involving two guys who do that all the time. That's so stupid. Why would anyone buy that for $2,241? I mean, not only is the red one the worst colour, but the box has already been opened. Sheesh! Wow. Not sure what's worse: the act itself, or the fact that I just sat here and watched it burn. Yikes. Interesting fellow, that dovetastic. Does this qualify as news? Also - under no circumstances should we be giving more views to a microwaving youtuber.. In my opinion it's not art. 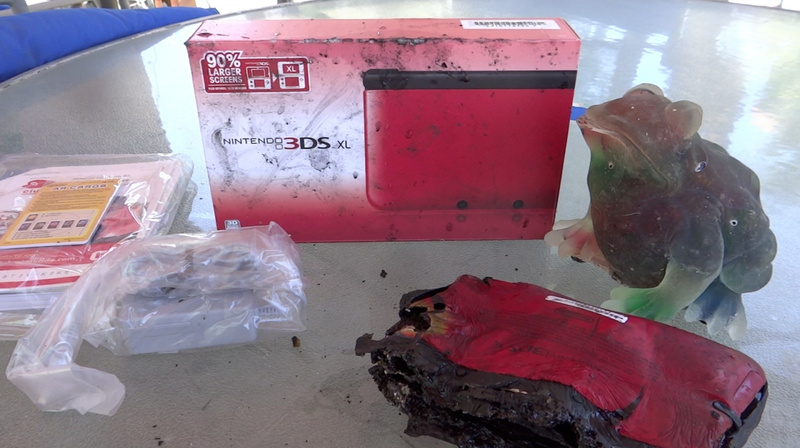 He could have made someone very happy just giving them the new 3DS XL, instead he destroys it and and sells it to some rich person for fun... it's not art. Neither he or the person who buys it will gain much happiness, while a person given a new 3DS XL would probably be twice as happy as the destroyer and the buyer combined. My eyes teared up — I couldn't help it. sniff I need a tissue.. The hell did I just watch. Why is it that shortly after the American launch, the 3DS XL has been subjected to dropping onto concrete floors and microwaving? I haven't seen anything like this following the British launch, or the Japanese launch. Who would be fool enough to buy this?! He isn't throwing a game in with the deal so you wouldn't even be able to play with it! Ridiculous. This guy is an absolute Moron! Think he needs to get himself a life! I don't really care about him microwaving it. He paid for it so he can do whatever he wants to it. The thing that gets me is how much it's going for on ebay. That's just madness. Why the hell would someone pay even $1 for it? Ok this is just dumb. next? As an avid watcher of 'Is It A Good Idea To Microwave This?'. this isn't that surprising. However, buying something new like that only to microwave it is a bit of a waste. At least IIAGITMT? got donated broken/nonworking items to destroy. That was pretty cool to watch, I must say. As soon as I saw the smoke start in the 3ds, I think my heart stopped. $2,000+ for a burnt piece of charred plastic and scrap metal? You know you can get the same thing for much, much less by just, I dunno, buying a 3DS and microwaving it yourself? This is stupid. People can find more productive things to do with their time. Okay, so it can be microwaved. But will it blend?! The only thing dumber than that would be the person who actually buys it on Ebay. @Millenia I agree, this articles are getting ridiculous. I honestly could care less if he wants to waste his money and ruin a perfectly good 3ds xl.. This guy is a mental case :? I think somebody got frustrated over being bombed by a Blue Shell one times too much. fyi also if you have a "quick pass" kind of card for your bus or train system that you use to tap your wallet and pay fares, DON'T keep 3ds games in there as well. It will brick them. I found this out the hard way. I tried everything else, they look spotless, and even on the inside the games look pristine, but no longer play in either of my working 3ds'. I thought magnetized things didn't affect newer games, but they're dead. I did this for months without problems but now they don't work. Why are people so stupid. His voice is very irritating. He seems to emphasize every other word for no reason. Thank god for the mute button. I'd rather give one to someone who needs some fun/distraction in their life than...microwaving it. Why isn't the WTF tag applied to this? I hope he ends up dieing in a giant microwave someday for the total injustice he has committed. Doctor Smash was the first person to do it to the original 3DS, with a big hammer back in 2011. I guess they're rich, probably the reason they can afford another one and destroy consoles for viewers to enjoy/rage/weep. Why on earth would anyone do that?! Not only is that wasteful, it's a very spoiled little thing to do in my opinion. All that money wasted because you thought you'd microwave your brand new 3DS. I can't stand people like this. Well hey, at least people like this still contribute to the amount of consoles being sold. So, joke's on them! Hey I just microwaved my expensive new Nintendo 3DS XL that YOU cant afford but I can, so give me $2,000 now, thank you... What a load of CRAP! @Mr_Gurgles No, it hasn't sold, that's how much the idiot who did this is demanding. I understand he's a partner and makes money off every video. I have no problem him microwaving the 3ds xl since that is his main thing about his channel. And it only half bothers me about the ebay thing. Sure he can sell it if he wants to and his fans can buy it but its more the fact he ups up a high buy it now price on the thing. If it was just an auction bid then no problem. But $2250 is far too much. if it was a $500 buy it then it wouldn't bother me. That guy creeps me out so much. I'm not even talking about the microwaving part. I just think he's super creepy. I know who would buy this! The CEO of Sony! poor 3ds....not my problem if it gets burnt by rednecks. HEY EVERYONE! If ya'll remember, Nintendo tests their products in various ways. This video could make Nintendo test their products in microwaves. So this has our world come to, after many milennia of highly advanced ancient cultures focusing on culture, technology and faith we are now having the pinnacle of being human in destroying valuable goods many people have to save up for a very long time, show it to the public and then even SELL IT for thousands of $ on eBay? Clearly all good is lost. The only thing that bothers me about this is that I often go hungry. There are much more generous ways of throwing money away. LOL, he just say: Its toast, doesn't work at all. Readng the comments here is amusing! What a sad little man and proof should you need it, that Youtube is indeed the internet's toilet. He gets money for microwaving things. If thats not the definition of the american dream I don't know what is. Wow... AND selling it for $2000+. Welcome to 2012. I'm pretty sure this guy is exclusively after what everyone here is giving him: publicity. Surely many of you will be linking to this video and tell your pals "Hey, look at this moron! ", letting him gatter thousands of hits. His plan has definitely worked. If you don't think there's people who are willing to throw money to the fire for publicity or that he won't use that publicity to make that money (and more) back then you must be new to the internet. He has a partnership on Youtube so he gets paid for this & can get another. All $2241 will go to buy this guy more stuff he doesn't need. Way to go America. I can't believe this show is still on, how many things can you blow up in a microwave and waste money on. Its pretty sad, all that money to waste on blowing things up instead of helping people. I usually don't mind these types of things (Unless someone microwaves the FFII Prototype or something like that), but that liquid coming out of the 3ds XL.... I don't want to know what that is. [Aughhh!] That was the sound of my heart when I saw the photographic evidence. @NinRyan He did fry a vita, along with a whole lot of other stuff that's way more expensive than a 3DSXL. Try an iPad. i wouldn't buy it for a TRILLION rupees!!!!! That was pretty cool !